I'm Jonathan Palfrey, a wandering technical author of British origin. I've been living in Spain since early 1997, and married Ana Llauradó Lavado on the 5th of December 1997. If you want my phone number or residential address, I'm afraid you'll have to write and ask me. Where is Sant Pere de Ribes? In the north-east corner of Spain you'll find the province of Catalonia, called Cataluña by the Spanish and Catalunya by the Catalans, who live here. The capital of Catalonia is Barcelona, beside the Mediterranean Sea. We live in a small town called Sant Pere de Ribes, which is south-west of Barcelona, a short distance inland from the coastal resort of Sitges. 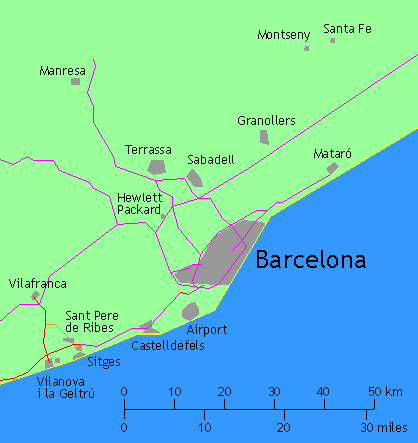 The map shows a small part of Catalonia, with Barcelona and the main towns around it, the motorways, and a few of the other roads. How is Sant Pere de Ribes pronounced? Sant Pere de Ribes is a Catalan name, meaning Saint Peter of the Riverside. The British sometimes pronounce it as though it were a French name, but it isn't. The inhabitants pronounce it as Sant Perra de Ribas. Ana tells me that pronouncing the final E as A isn't standard in Catalan but is normal in and around Barcelona. By European standards it's mostly rather dry, with quite hot summers and mild winters. See full temperature details. I've worked in seven countries, lived in a number of others (as a child), and visited yet more. If you really want to know, see the full list.